Mom To Grandma is here again with awesome hosts to bring you some sweet prizes. We have started our giveaways from our Holiday Gift Guide which begins November 1st. Come back and visit often over the Holiday Season! I have teamed up with a fantastic group of bloggers to share some awesome giveaways with our readers. Be sure to hop around to the participating blogs listed below and enter some fabulous giveaways, all of which are worth a minimum of $25! 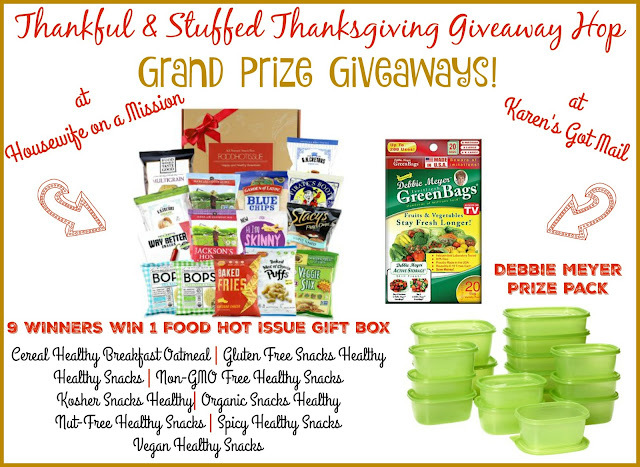 Also, make sure to enter in the two Grand Prize Giveaways – Debbie Meyer Prize Package and Food Hot Issue Snack Gift Box (9 Gift Boxes- 9 Winners total)! Mom To Grandma's Sponsor is MAGFORMERS rv $79., Awesome! VIEW ON MAGFORMER'S WEBSITE HERE . Must be 18, US only Sorry friends! Winner must return the winning e-mail within 48 hours or forfeit. Please give RC a moment to load. Although any one task will enter you, the more you enter the better your chances. Found this from the blog hop, and I would give it to my grandson. I wa on a blog hop and there it was. Love the name Mom to Grandma. I too am a grandma. However if I won this toy it would go to my godson. I found this giveaway in the blog hop! I would give this product to my grandsons to play with! They would enjoy it! I would love to win this for my grandson. He would just love it. I think it looks like a lot of fun. I found this giveaway on Facebook and in the linky of the thanksgiving hop. If I win, I will give this to my son! Found the giveaway hop on Literary Winner's FB page and I would give this to my grand nephew for Christmas. Thanks for a great giveaway! I got an email from Bloglovin and it had this giveaway in it and i had to check it out! If i won the goodies would be added to the Christmas box! I found this giveaway thru the hop on Gator Mommy. I'd give this to my friend's daughter on her 4th birthday. I was already a subscriber to Mom to Grandma - so I read about the hop on your blog. My grandson would have a lot of fun playing with this nice toy. I found this giveaway through the giveaway hop and I will give this to my youngest son for Christmas if I win! I would really like to give this to my son for Christmas. I found this giveaway through the link on Planet Weidknecht. Not sure if I spelled that right. I found this giveaway following the blog hop! This looks like such a great toy for my grandson so I would give it to him. I found this great giveaway on the blog hop. My son would love these awesome Magformers, I could already imagine him building for hours with them. This would definitely be a great Christmas gift! Thank you for the chance! I found this giveaway n the blog hop from Karens Got Mail and I would gift these to my son!! We would have so much fun together!! I found this giveaway on the Thanksgiving blog hop. My grandson loves Magformers. He plays with them at pre-school but I would love for him to have some at home. I found this giveaway by stopping by like i do every few days to see what you have going on. I would save this and give it to my six year old son for Christmas. He would LOVE this so much!! I found this giveaway on Twitter - someboday had tweeted it and lucky me! I've been wanting to try a set of these for a Christmas present for my son. Thanks! I found this giveaway on a blog hop. I would give this to my grandson for Christmas. My grand nephew is really into legos, he's 6 and I think he would love these. Thanks for the giveaway! I found this giveaway on the blog hop and I plan to gift it to my amazingly creative and cute 3 year old!! I found this giveaway because I am one of your email subscribers. This item looks really neat; something my daughter would love! I found the giveaway on the blog hop I am a member of. My grandson would love this toy to play with. He loves building things. great giveaway, thanks for offering it. I would be so happy to win! What a wonderful giveaway. I have just gone from mom to grandma and am thrilled to finally become a memeber of that glorious club. He is the light in my heart! Happy Thanksgiving. I found this giveaway on sue parks 2003 bloodspot. If I win, I will definitely be excited and keep for myself. I found this giveaway on the blog hop! My son and hubby would have so much fun spending time together building these!! I found this on your giveaway tab. I'd love to keep this for my boys since they love creating and making things with their very own hands. Found it from the blog hop!! My son and I would have tons of fun with these!! Im sure dad would join in and it could be a whole family toy!! I found the giveaway on a blog hop and if I won I would give to my grandson as a gift. Found it on the blog hop! I'd give this to my toddlers! It would be great to help them learn to build and help with dexterity! Such a neat toy! I found you on the blog hop and my son and I would build a giant castle!! He has lots of dragons for it! I found this giveaway via Thankful & Stuffed giveaway hop. I would give this prize to my niece. I found this giveaway on twitter! I would give this set to my 6 year old son for Christmas. He would LOVE it!! I found this hop in an email from Rockin' Book Reviews. I saw the first post about the blog hop on twitter and started at Karen's Got Mail. If I won this prize I would give it to my daughters. They both love building sets. I found this giveaway on the blog hop!! My son and I would build all sorts of creations and work on our colors!! I found this giveaway through Twitter! I would love to win this for my daughter for Christmas! I found this giveaway on the hop and I would give this to my nephew for Christmas. I subscribe to your emails so I found this giveaway in your email you sent to me. I would give these Magformers to my grandson for Christmas. He loves to build things! We plan to use these to build and to learn shapes and colors!! What a great and fun learning tool!! I found you on mama baby's cupcakes blog hop!! Since money is extremely tight and with 8 grandchildren to buy for , this will surely be used for a Christmas gift for one of them , who ever I gift this to will surely enjoy playing with these.. I found this giveaway on a contest website. I really hope that I can win this for my nephew. I follow almost all of the blog hops that I can find. I am sure my great grandchildren would love these. I find out about the giveaways from my wife. She tells me and then I enter them. Thanks for the chance! I found this through the blog hop! I would give it to my son, I think he would love these!!! I found this giveaway through the blog hop!! I would definitely give these to my son, I've been eyeballing these for a while, but they're a little out of my budget! If I win I will give to my 4 year old nephew. he has been begging for this but I am poor and I would love to win for him. Please. I found this giveaway via the linky on Karen's got mail. I will either give this to my son or to my nieces. I found your giveaway through a blog hop link but I do not remember where I started the hop! I will give this my granddaughter. I fount this on the blog mom to grandma. I will give this to my youngest son. It will be fun and educational for him. I found this giveaway through an e-mail from your blog! I found this giveaway through the giveaway hop and it would make a great Christmas gift for my kids! They have played with a similar set at a neighbors house and loved it. If I win this giveaway I will give t this to my two younger children ages, 7 and 10. We like to get them building toys often. I found this giveaway on the hop! I signed up for newsletters too! If I win I would save it for Christmas and give it to my grandson.He would love to have it. I found your giveaway on Thankful & Stuffed giveaway hop. I would give this to one of my grandsons. He likes to take things apart and put them back together so this would be perfect..